I never miss an opportunity to be a picnic evangelist, so I’ve rolled this old column out of the archives with the hopes that you’ll enjoy one where you live soon. With this experience I especially enjoyed combining cultural history, exercise, relaxation together as a family, and good food…. One of the finest family adventures ever devised by man is that of the humble picnic. 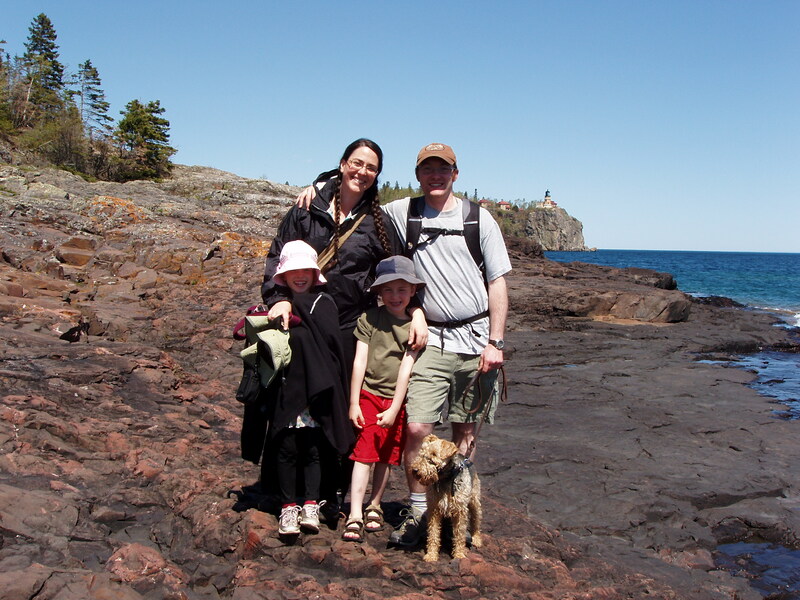 We are especially fortunate, because the options within Duluth and along the North or South Shores are nothing short of astounding. We seem to be at the epicenter of the picnicking universe, and all the best picnic sites (even on the 4th of July) are underutilized. So you’ve got half a day free. Would you rather sit at home in front of a ballgame on the tube or strike out on an adventurous picnic? 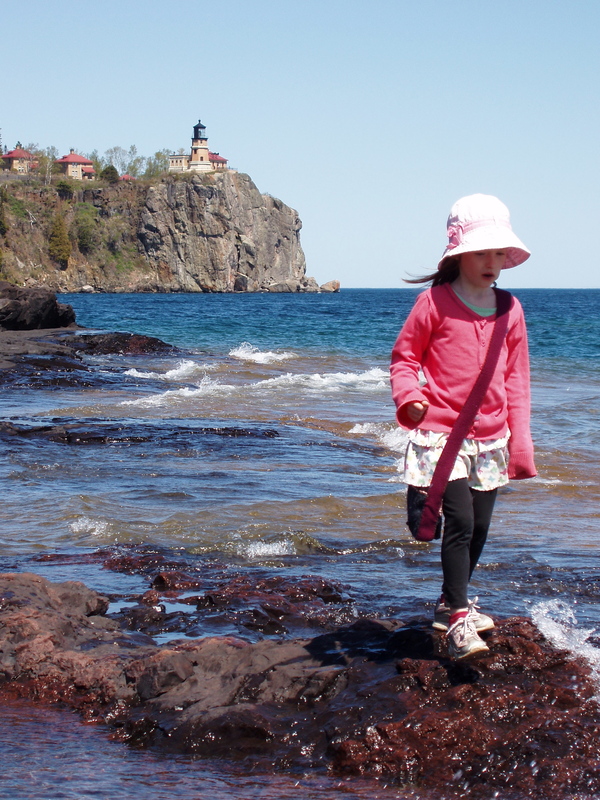 Split Rock Lighthouse State Park, for example, has one of the finest picnic areas on the shore. Each picnic site is situated in a secluded wooded setting much like a private campsite, and most even have a fire pit. 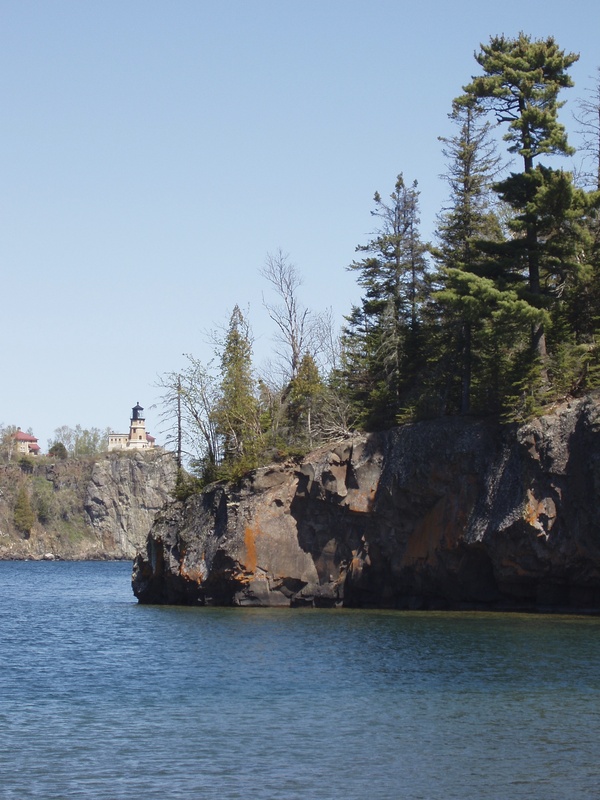 Our site opened up on the gorgeous rocky beach that lines a small bay that is protected by a small island, and all this is under the watchful eye of the Split Rock Lighthouse. The views of the lighthouse juxtaposed to the magnificent scenery are marvelous. When the season allows, the hike out to the island across the rocks provides an experience and scenery that is unparalleled in the entire state park system. The deep blue water descending to the abyss right off a ledge from some nearby rocks is jaw dropping, and the ever present lighthouse (as much a part of the landscape as anything else) is the only sign of people to be seen for miles from the far side of the island. After lunch we strolled over to it, which is the most visited lighthouse in the United States, and were disappointed to learn that the guided tours weren’t beginning for the season until a couple days AFTER Mother’s Day. This was my only qualm with an otherwise well run operation. Since the tours weren’t up and running yet, we were afforded the opportunity of roaming the lighthouse grounds free of charge. 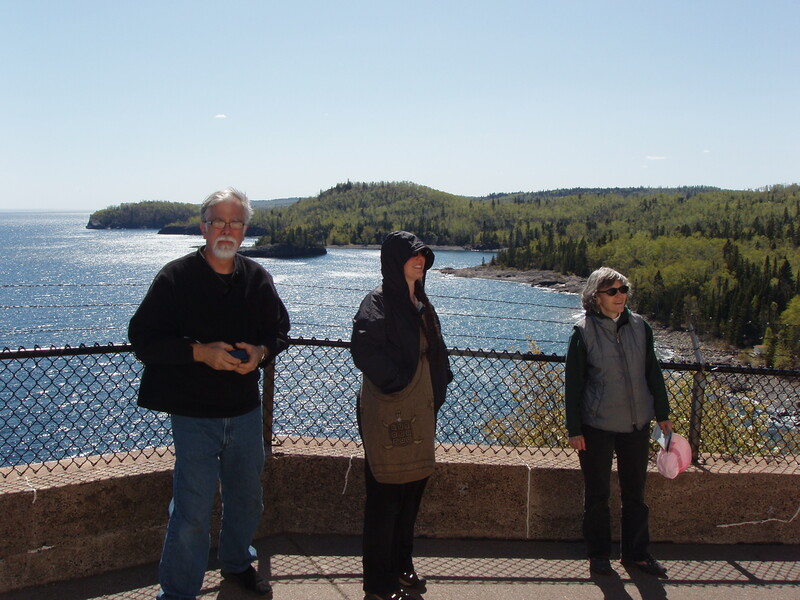 The views from atop the rock where the beacon sits are incredible, and we were fortunate to experience good stiff winds off the lake to add to the experience on this great inland sea. We also greatly enjoyed the film in the historical society’s visitor center. It was a very nice calm 20 minute respite for my tired kids. From there we set off on bikes down the Gitchi Gammi Trail to Iona’s Beach, which is just 4 short miles away down a portion of the trail that is largely away from the busy highway and winds through the forest and up and down hills. If you haven’t been to Iona’s beach, it is a destination in its own right. It faces up the lake to the northeast, so it would also be an impressive place to watch the waves when the surf is up. It involves a short walk from the parking area and is located at mile marker 42. The setting seems rather secluded due to the short quarter mile hike that takes you away from the parking lot and highway, and largely due to the fact that most people seem unaware of this treasure. The beach is very expansive, and is composed entirely of a pinkish rhyolite rock. None of the rocks are special in and of themselves, but as companions they are very beautiful all together on the beach. Since they are relatively flat, there are plenty of skipping stones to be found. Cliffs up the shore make the view up the lake especially picturesque. Thus we ended our picnic following a little hiking, biking, and the cultural experience of the lighthouse. Where else are you going to get this? We lived for a spell in Massachusetts, and on one occasion we drove along the Atlantic Ocean from our hamlet north of Boston all the way to Kennebunkport, Maine, and were unable to find a single place where we could park the car and enjoy time together on any significant tract of public land on the waterfront. It simply doesn’t exist in most other places. Perhaps you and your’s could enjoy a picnic with the dad in your life this Father’s Day. 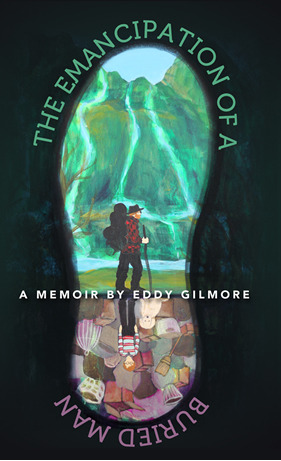 Plan it all out, pack the car while he reads the paper, and enjoy a dandy of an excursion. That beats a new tie any day.